This textbook is for beginning students of Arabic who are seeking to develop communicative oral skills in colloquial Levantine Arabic , the dialect used in Jerusalem and in contemporary Syria , Lebanon , Jordan , and Palestine/Israel . 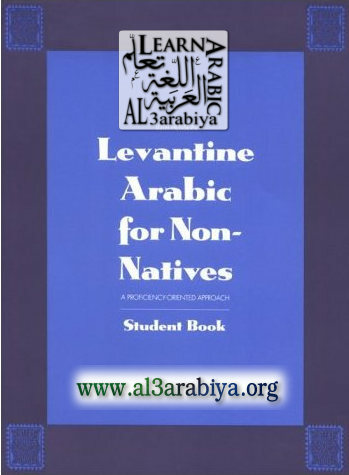 It is the first textbook for colloquial Arabic developed according to the principles of the proficiency movement in foreign language teaching , in which the emphasis is placed on the use of meaningful drills , activities that are appropiate to the context in which the language will be spoken , and a balance between linguistic accuracy , and active use of the language . The first half of the teacher’s manual is devoted to a series of “functions” that focus on specific spoken activities , such as greetings , identifying objects , or asking for information . Each function is accompanied by explication , classroom activities , and sugestions for other activities both in and out of the classroom . The second part provides a series of ten situations in which passages in the colloquial dialect , mostly in the form of narratives , are intended to take the students beyond the level of basic communications to a more descriptive and narrative mode . The text is accompanied by charts and glossaries . A set of audio tapes is keyed to the individual functions and situations . The second part of the teacher’s manual is available as a separate book for student use . Levantine Arabic may be used as the ‘Primary text’ for a course designed exclusively to teach colloquial Arabic , or in conjunction with beginning and intermediate courses in Modern Standard Arabic . I would love to see some nice person post the audio tapes accompanying this …. if not , I will try to do this myself gradually . Once again , thanks to the original uploader .